Beetroot was one veggie that's not a popular choice even with adults due to the stain it leaves on the plate / utensil while cooking. 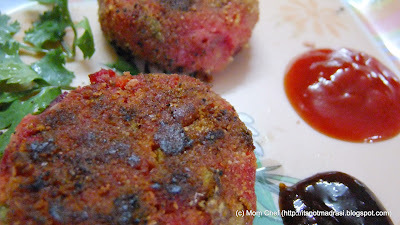 However, its a veggie filled with nutrition as detailed in my earlier post - Beetroot poriyal. Today, I made Beetroot Cutlets with this vegetable as the main ingredient. I restrained from adding green chillies in any form and also used powdered "soup sticks / bread sticks" instead of bread crumbs, and the texture was quite different. This can be either a lunch box item or an evening snack too with Tomato Sauce and / or "imli/tamarind chutney". 2) Mash the veggies well, add all the masala powders, salt, turmeric and coriander and mix well. 3) Make small roundels of this mixture and pat into patties in your palm. 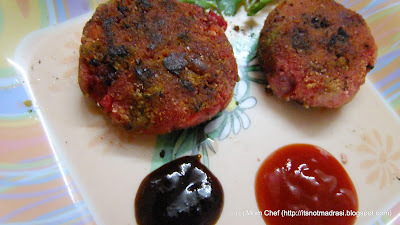 these cutlets look superbly delicious dear!